Daily prize – For today's prize –two copies of Kit's book 'Escape Clause' is on offer. To enter please 'Like us' on Facebook and leave a comment here on this blog in the comments section below from now to December 22nd, for a chance to win. Just make sure you leave your contact information. To find the holiday hat #9 you will need to take a visit to our Facebook page - find the url and save it somewhere safe! Yes, number 9 is on Facebook not Kit's blog! 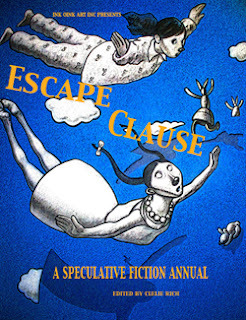 From the minds of award-winning storytellers and rising stars in the field of speculative literature, we bring you Escape Clause, the Anthology: twenty-six short pieces of imagination and wonder. - Is it dangerous, Sir? - Oh, I should think not. Just don’t let the pigeons get too near. An overweight teen stranded at fat camp, notices his fellow inmates going missing. And it's not mere weight loss. A body-builder finds a painting, and does the right thing, returning it to the artist who lost it. But is it the really right thing? A newly dead man is tasked with cultivating the sorrows of the living. A ghoul proves that you don't have to have a mind of your own to know right from not quite right. A soldiers tries to thwart a prophecy that someone will steal his one true love. Curios and Oddities await your turn of the page in this collection of short fiction. Tales as diverse as our international writers will take you from Egypt to outer space with a few stops on and off the map. If magic and mystery and solid genre writing appeal, this is the book for you. I am thrilled to introduce you to the people who are bound to become some of your favorite authors. This change of tour date is due to Kit unexpectedly being unable to participate in the tour. Apologies for any inconvenience caused! The link in the post for entering day #9's contest is broken, but appears to be pointing back to this blog, so I'm leaving a comment here, in hopes that is what I need to do. Thank you Kathy, yes, i think that may be because the tour place changed. Sorry about the confusion. I'll let everyone know. Meanwhile, good luck and thanks for entering! If you want to win the Escape Clause, I'd like to clarify the blog to leave your email address is here now, not Kit's blog. If lots of people entering the holiday hat contest get this number & url wrong, I'll just let everyone have the correct answer to be fair.